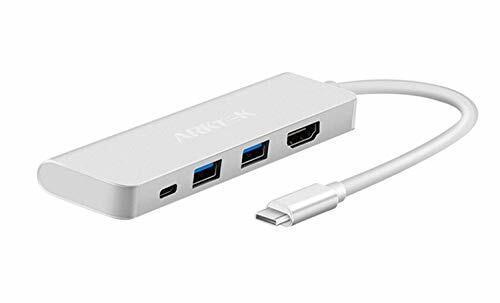 ARKTEK USB-C to HDMI HUB Adapter is an exquisitely designed video adapter as well with multi ports, which expands your workspace and boosts the productivity. Up to 5 Gbps data transfer, able to connect USB keyboard, mouse, and flash drive. Backward compatible with USB 2.0. USB-C (female) charging slot supplies pass-through power to charge your laptop simultaneously. 1. High-power devices need power adapter or please connect to a charger when using. 2. USB-C (f) charging slot only supplies pass-through power, does not support data transfer. 3. 4K output needs an HDMI-1.4 (better 2.0) cable. Suggestion to lessen interference when you connect wireless device through USB 3.0 ports. 1. Switch your router/Wi-Fi signal to 5Ghz. 3. A good USB 3.0 cable is recommended to keep your device away the interference. 4. Better if you use well-shield USB 3.0 devices. 5. NOT compatible with Nintendo Switch HDMI output currently. If you have any questions about this product by ARKTEK, contact us by completing and submitting the form below. If you are looking for a specif part number, please include it with your message.